North Alabama’s Premiere fiber studio. Dedicated to making great yarn accessible for every budget and style to Huntsville and Madison Alabama. Every product in the store is hand selected by the owner. Take a virtual tour of our local yarn shop below! After graduating from the University of Alabama in Huntsville with an Industrial and Systems Engineering degree, Anastasia “Nina” Antonison fell in love with fiber. 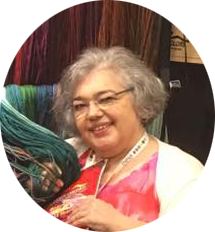 Armed with her degree in Engineering she decided to take her skills and open up a local yarn shop(lys) in Huntsville, AL to sell and promote the crafts of knitting, crocheting, weaving and spinning to Huntsville and Madison Alabama. Nina commits to bringing the best quality of natural fibers to the Tennessee Valley. Everything in the store is personally selected to bring the best natural fiber to the Huntsville and Madison. One of the only stores that will machine wind your skeins in record time. In the store, we do not charge for project help or advice, all that is asked is for you to patron the store. Check out our events for our knit-alongs. Learn new techniques and meet others! "This is a fabulous shop. This store is all about the yarn. She has terrific inventory. Something for any knitter, crocheter, spinner or weaver." "I LOVE Fiber Artwork! The yarns are fantastic!! Miss Nina know all about the fiber so she helps me pick a yarn which will make my project a success. What a pro!!" "My mom and I stopped by Fiber Artwork while I was home this past weekend. The store was wonderful!! I love how bright it is and all the mirrors. The store had all the right yarn and some cute notions and accessories. The location is perfect for Huntsville shoppers. I will be visiting again when I come back to town." *Best way to contact store is to text the above phone number.